About Walter Benda . . . 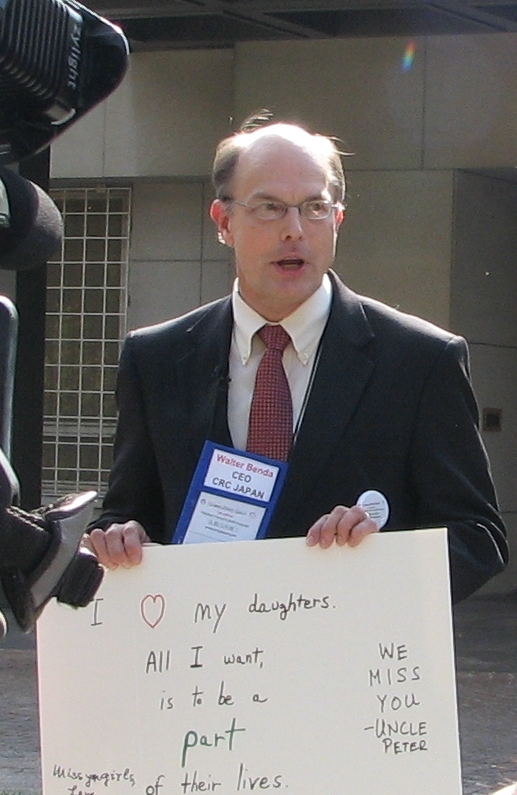 Since 1996 Walter Benda, whose own children were abducted and retained in Japan, has served as CEO and Co-Founder of Children’s Rights Council of Japan, a non-profit organization operating under the 501 (c) (3) group exemption of the U.S. based Children’s Rights Council. In 1998 Senator Jesse Helms, on behalf of the Senate Foreign Relations Committee, called upon Walter to provide a statement for the Congressional Record regarding the international child abduction issue in Japan. This was the first time that this issue concerning Japan was brought out into the open before the U.S. Congress. In 2000 Walter was requested by Senator Patrick Leahy to testify in person before the Senate Judiciary Committee regarding the Elian Gonzalez case. During his testimony Walter once again publicly shed light on the international child abduction issue concerning Japan. in 2002 he was recommended to President Bush by Senator John Warner to participate in the White House Conference on Missing, Exploited, and Runaway Children which Walter attended on September 24, 2002. Walter has organized and participated in numerous public events relating to the international child abduction issue. These have included press conferences, seminars, and conferences, as well as demonstrations and rallies, in numerous locations, including Washington, D.C., New York City, and Tokyo, Japan. He has written articles about these issues and also been featured in international media in the U.S., Japan, and Europe. Due to these and many other related activities, as well as the personal legal knowledge gleaned from dealing with his own case in the U.S. as well as Japan (where it was appealed to the Japanese Supreme Court level on two separate occasions) and the experience gained from advising hundreds of parents over the years, Walter has established a resource base that enables him to offer expert witness and consulting services in this field. Among the areas he can assist with, both on a legal and a practical basis, are issues relating to child abduction by family members, denial of visitation/access rights, child custody, divorce and separation matters, child and/or spousal abuse related issues, and preventative strategies to avoid access and divorce problems. For more information, email crcjapan@yahoo.com.